The new major advice R410 stands for a new product line, it offers the highest longevity and kilometer performance as well as safety for cars and small freight cars. DURAVIS is durable. These new tyres are tough, designed to stand up to daily deliveries and heavy use, while the jointless cap layer construction provides durability at highway speeds. Longer wear life. Tests show that DURAVIS provides longer wear life than other leading tyres. New C.S.C. tread-block technology and a specially optimised tread pattern reduce irregular wear and provide exceptionally high mileage. Handling like a car. 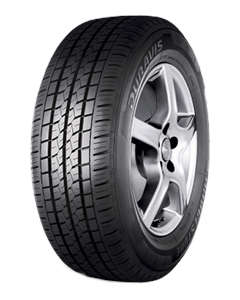 Specially designed with an advanced tread block design, DURAVIS handles like a car tyre. It gives modern vans a smooth, comfortable, quiet ride – whether manoeuvring on city streets or cruising on motorways. Top performance in the wet. Drivers will notice the difference on wet and greasy surfaces, where DURAVIS provides better grip, safer cornering and less risk of aquaplaning. Stewartry Tyres free tyre check. Quick delivery and on the next day. Good prices for tyres.